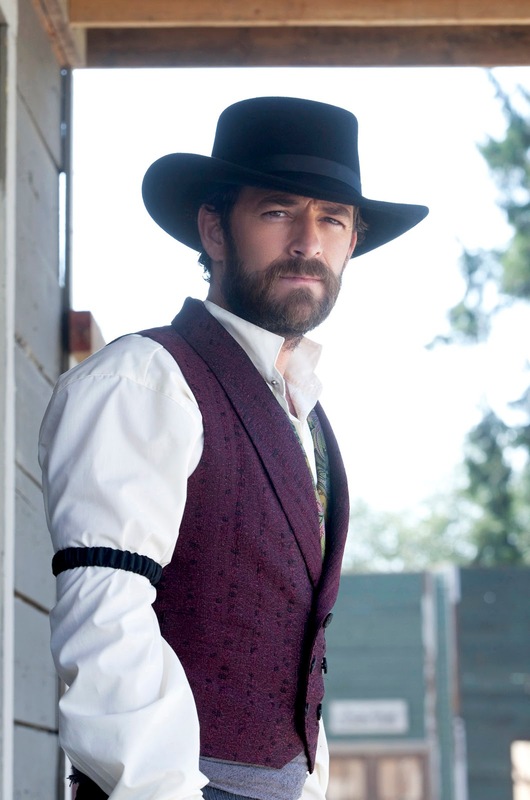 In 2008, he starred in “A Gunfighter’s Pledge,” an original movie for the Hallmark Channel, which just so happened to be his favorite genre of film: a Western. Luke is back in the saddle in another Western for Hallmark; this time playing circuit judge John Goodnight in “Goodnight for Justice,” which premieres Saturday, Jan. 29 at 8 p.m. and re-airs all throughout the weekend (check local listings for times). I caught up with Luke recently, and he told me all about his latest endeavor with the Hallmark Channel. Celebrity Extra: Judge John Goodnight is a character that you created, although you didn’t write the movie. What was the process of Judge Goodnight becoming the central character in the movie? Luke Perry: I was reading a lot about Andrew Jackson. Before he was the president of our country, he was a circuit judge. I found the time that he was a circuit judge in the Carolina hill country in Tennessee to be really interesting, and this whole idea of traveling from place to place as judge, jury and sometimes executioner. I thought, “That’s an interesting character.” I developed the story. I wrote three or four pages of what I thought the story would be. Then I met Neal and Tippi Dobrofsky, who are a husband-and-wife writing team that Ira (Pincus), the other producer, put me in touch with. And they fashioned a screenplay out of the story. CE: Was it Hallmark’s idea to get Jason Priestley involved, or had you been wanting to work with him again? LP: I like working with Jason a lot. There is a company involved in making this movie called Entertainment One. They work here in the United States, but they are based in Canada. So, if you are in business with them, you have to do your stuff in Canada, which means you have to have a Canadian director. And when they said Canadian, I thought, “I’ve got one of those.” That was easy enough, and it was the right way to go because he’s a smart director. It was great working with him on this. We got to prep the picture together and do the casting and all that stuff. We’ve had years and years of practice together, and it was just easy. CE: Speaking of casting ... I felt the casting was superb. Everyone did a great job, whether they had a minor role or a major role. LP: That’s nice of you to say, because we read with every single actor. I was told that most producers and directors don’t do that. We read with every single person that came into the room — every boy, girl, man, woman, child. It was fun for me. I mean, it was hard and made for long days, but it was so nice to hear you say that. It really is, because a lot of times those actors think, “Oh, Luke’s in the movie and it’s directed by Jason, and that is all anybody is going to notice or hear or talk about.” And to hear you make an observation like that, that makes me feel good. CE: In this movie you get to work with horses, which you have told me you love to do. LP: Yes, I prefer them over people. CE: And you didn’t have to shave, so that was a bonus. LP: Yeah, you just comb your face and get out there. CE: How long did it take you to shoot the film? LP: Fifteen days. We had exactly 15 days to do it, and that’s a crazy-fast schedule. That’s very much tribute to Jason and the crew, and how hard everybody was working. CE: What are some things that you hope that the audience takes away from this movie? LP: You hope that everybody has a sense of right and wrong. Sometimes I look at the stupid stuff that goes on in the world and I’m not so sure that everybody has a sense of right and wrong. You sort of want to give everybody the hope that if something bad happens to them, somebody somewhere is going to try to make it right in the right way. The law should not be about finding loopholes for guys like Bernie Madoff to steal billions of dollars, the guys at Enron, stuff like that. It’s the lawyers who allow a lot of that to take place. When you strip away all of that and you get down to the basics, it’s always about somebody trying to do the right thing. That’s always a great place to tell a story from. CE: I love in the very beginning when your character, John Goodnight, says, “Every man is ordinary until he does an extraordinary thing.” It’s simple, but it’s profound. LP: The best things in life are simple. I’ve always been a fan of the simple things. It doesn’t have to be complicated; it can be that simple, right there, just a thought that sticks in your mind. You’ve got to do something extraordinary at some point in your life. CE: With you and your career, I like that you pick roles that are right for you. You seem to be a bit choosier than other actors. That way we get to see you in these good roles that are sometimes a bit obscure. LP: The trick is you really have to keep trying different things and taking chances. When you get so precious about your work, or the perceptions of your work, you die creatively. As an actor you’d be dead in the water. LP: Well, what to do … I don’t know. I’ve got two more of these circuit-judge stories I’d really like to tell that I hope Hallmark will be willing to do. We are talking about that again next week, actually. But I’m definitely going to be getting back to work, I know that. I haven’t been doing much the past two or three years, and I feel good and rested and ready to go.